Fire ant workers can be found in many different sizes ranging from 2-6 mm. The body color is red to brown with hints of black. The stinger is visible at the tip of the ants abdomen and can inflict a great deal of pain. Fire ants are an invasive species. Fire ants are native to South America and it’s believed they arrived in the U.S. on cargo ships in the early 1900s. Fire ants are tropical pests, which have invaded Manatee and Sarasota Counties. Fire ant mounds can be found everywhere; they are outside homes in Lakewood Ranch, schoolyards or parks in Sarasota, and even inside homes in Bradenton. Fire ants live in the dirt and build mounds on top of their nest. Inside the mounds, fire ants create tunnels for navigating throughout the colony. The queen fire ant can live up to six years. The workers are broken up into three groups; the majors, medias and minors. The majors live 90-180 days, medias live 60-90 days and minors live 30-60 days. Fire ant colonies are exceptionally large in size, fluctuating between 100,000 and 500,000. The queen fire ant produces eggs at an incredible rate. The queen can lay between 1,500-5,000 eggs per day, making pest control for this invasive pest extremely difficult. Fire ants are omnivores, eating both plants and animals to fulfill their nutritional needs. The fire ant diet consists of insects, animals and honeydew. They will enter homes in search of nourishment and consume a variety of food including proteins, sweets and fats. Fire ant workers are predators and have strong mandibles to bite their target. Their abdomen contains a venomous stinger to paralyze and kill their prey. Once the victim has been paralyzed they carry it back to the nest for the others to eat. Fire ants sting over 5 million people each year and more than 25,000 people seek medical attention because of ant bites. A fire ant bite can cause allergic reactions, send people to hospital, and in some cases, cause death. Fire ant bites occur when a mound is disturbed. The fire ants crawl onto the victim and secrete a pheromone that signals to the others to sting in unison. 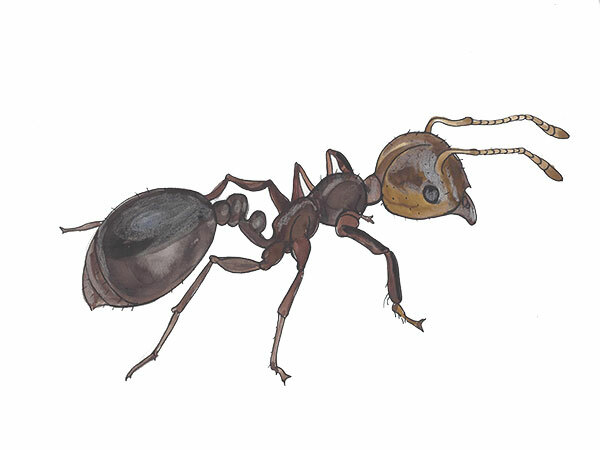 When a fire ant bites, it injects a necrotizing alkaloid venom, which causes pain, swelling and discomfort. The reaction can last up to an hour following by blistering and itching. A white pustule will appear the next day at the location of the sting. Allergic reactions from fire ant bites and stings are extremely common and dangerous. Symptoms can include, perspiration, inflammation, chest pain, vomiting, hives, slurred speech and shortness of breath. People experiencing these symptoms should seek medical attention. The fire ant is an invasive, non-native ant species that devastates ecosystems and causes billions of dollars in damage. The Food and Drug Administration estimates that American citizens spend more than $5 billion each year on damage, medical treatments and pest control for fire ants. Fire ants are also estimated to cause over $750 million in damage to livestock, crops, farms and house pets. Fire ants impose immense pressure on native insects, wildlife and ecosystems. Fire ants destroy good insects, which help protect native plants. Fire ants are also a huge threat to helpful reptiles such as frogs, lizards and snakes. Fire ant control can be managed two ways; individually treating mounds or through broad-spectrum applications. Baits are very effective with treating ant mounds. When using baits it might take several weeks to eradicate the entire ant colony. Place a small amount of bait just outside the ant mound so the workers will carry a lethal dose back to the queen. Insecticides are also effective for individual mound treatment and may work even faster. Getting the chemical deep enough into the colony is the most difficult task, especially because the queen is often located deep within the galleries. When applying a broad-spectrum treatment, granular insecticides are scattered over a large area. The benefit of a broad-spectrum treatment is the ability to cover a large area without having to track down each individual ant mound. Sometimes ant mounds are not visible and if each one is not treated, fire ant problems will persist. We are available to assist with ant control Lakewood Ranch, ant control Ellenton, ant control Bradenton Beach, ant control Parrish, ant control Anna Maria and surrounding neighborhoods. Please contact us for additional information about ant control and how to get rid of ants in your home for good.